Do I have arthritis...and what do I do about it? In this issue we introduce three web workshops which discuss the topic of osteoarthritis and strategies for its prevention and treatment. Do I have arthritis... and what do I do about it? Recognizing that approximately 1 in 10 Canadians are affected by osteoarthritis, Arthritis Consumer Experts (ACE) is committed to providing its members and subscribers the latest information to people living with this very common chronic disease. As part of a research team led by internationally recognized researchers, Drs. John Esdaile and Linda Li, and with support from the Canadian Institutes of Health Research (CIHR) - Institute of Musculoskeletal Health and Arthritis, ACE created a three-part series of web workshops to help answer your questions about osteoarthritis. This exciting web workshop series will help the public determine whether they have or are at risk of osteoarthritis, as well as help those already living with the disease to make research-based decisions about their treatment plan. All three web workshops in the series titled “Do I have arthritis and what do I do about it?” are available at our JointHealth™ website: www.jointhealth.org. In addition to the web workshops being available on our website, ACE is launching “YouTube” compatible versions which will make it easier to share this exciting education series with friends and take advantage of the online networking world. The first web workshop in the series is presented by internationally respected rheumatologist and Scientific Director at the Arthritis Research Centre of Canada, Dr. John Esdaile. In it he describes early osteoarthritis and lists the factors that are linked to an increased risk of developing the disease. 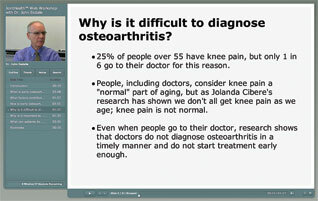 He talks about how early osteoarthritis can be diagnosed, citing research that examines barriers to diagnosing it. Also, he discusses the importance of early diagnosis in treating and managing osteoarthritis, leading to the topics of the two web workshops that follow. After viewing, please fill out our online survey. Your participation is vitally important for determining whether the key goals of each workshop have been met. Additionally, it helps us learn what information is most relevant to you for future JointHealth™ monthly publications. This second JointHealth™ web workshop in the three-part series on osteoarthritis is presented by Dr. Linda Li, the Harold Robinson Professor of Rehabilitation Sciences at the University of British Columbia. 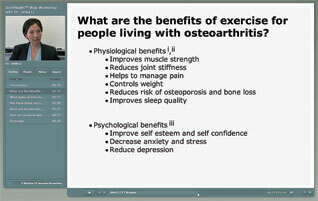 Dr. Li talks about exercise as a management strategy for people living with osteoarthritis. The information provided in this web workshop includes the physiological and psychological benefits of exercise. Dr. Li lists the types of exercises that are suitable for people with osteoarthritis, explaining that there are few kinds of exercise that should be avoided. Also, she gives many reasons why it may be difficult for those living with osteoarthritis to get into a routine of exercise and she provides advice on how to get started on an exercise program. 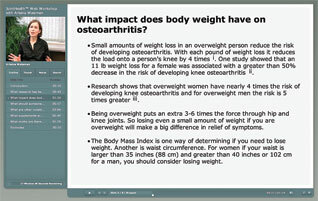 This JointHealth™ web workshop is the last in the three-part series on the subject of osteoarthritis. It is presented by registered dietician, Arlaina Waisman. Topics of discussion within the web workshop include how body weight is linked to osteoarthritis and the benefits of weight loss in preventing osteoarthritis or reducing the severity of the symptoms. Ms. Waisman also talks about the guidelines for proper nutrition provided in the Canada Food Guide and how they relate to managing the disease. Also discussed are important nutritional supplements (and those that are not). Finally, she describes and discredits some of the myths surrounding types of food to be avoided by people living with osteoarthritis. If you think you may have the beginning stages of osteoarthritis, it is important to see a doctor as soon as you can. The earlier osteoarthritis is diagnosed, the better your chances of slowing the progression of the disease with early treatment and management. An essential component to reducing your chances of developing osteoarthritis is maintaining or returning to your body’s ideal weight, which can be achieved by regular exercise and a healthy diet. It may seem counter intuitive, but exercise will also help lessen pain – it is useful for maintaining full range of motion in your joints and counteracts muscle weakness that can result from inactivity. In particular, strengthening the quadriceps (thigh muscle that wraps around the kneecap and is the muscle that straightens out the leg) will stabilize the knee joint. Weight loss can be aided by eating a healthy diet, rich in nutrients and low in empty calorie foods, along with controlling portion size. Carrying around extra weight puts additional force on the hips and knees – each pound of weight loss reduces the load on the knees four times – so losing weight will help manage the symptoms of osteoarthritis and help prevent further damage. If you have already been diagnosed with osteoarthritis, it is likely you have been experiencing pain for a while and that there is a chance there has been some damage to your joints. However, it is still valuable to be at your ideal body weight, for the same reasons cited above. Exercise and good nutrition are keys to preventing the damage from getting worse and to help reduce the symptoms. Before starting a new exercise program, it is recommended that you discuss it with your doctor, physiotherapist, or fitness instructor and ensure that your regimen is appropriate for arthritis. Pain may be a barrier for getting into a regular routine of exercise, but taking a pain medication such as acetaminophen (e.g. Tylenol®) a half an hour before starting a workout can help. Another tip that may lessen pain is heating, except when inflamed, or icing the affected joint before and after exercise. Your doctor, physiotherapist, or fitness instructor can advise you in making the right choices for your situation. If your osteoarthritis is advanced, your doctor may advise surgery, such as joint replacement. It is still important to maintain a healthy body weight, to exercise, and to eat a healthy diet. If, before surgery, you are overweight, weight loss may help lower the stress on your new joint, in addition to decreasing pain and managing the symptoms of osteoarthritis in the meantime. However, dieting in the month before surgery is not recommended – having a well-balanced nutritious diet is. If you smoke, another helpful tool for aiding your recovery is to quit or cutback on smoking as soon as possible. Quitting about eight weeks before your scheduled surgery is ideal. The benefits of quitting are that it will reduce the time it takes for your surgical wounds to heal, lower the chances of getting infections, and decrease the length of your hospital stay. Following these steps may help manage the symptoms you have now, improve your recovery from surgery, and help you get the most benefit from your surgery. Arthritis Consumer Experts acknowledges the generous support of the Canadian Institutes of Health Research (CIHR) - Institute of Musculoskeletal Health and Arthritis, for this web workshop series. This project is an education and research initiative, so an important aspect of this project involves your participation in our online questionnaires. As a part of our funding agreement with CIHR, we have committed to survey people who have used the web workshops, in order to ensure that key objectives of the program have been met. Please take a moment to complete the questionnaire that accompanies each of the web workshops. It will test your new knowledge and help us to determine the usefulness of providing this information. Links to the questionnaires are available at the foot of the previous page and on the website. The material contained on this web site is provided for general information only. This web site should not be relied on to suggest a course of treatment for a particular individual or as a substitute for consultation with qualified health professionals who are familiar with your individual medical needs. Should you have any healthcare related questions, you should contact your physician. You should never disregard medical advice or delay in seeking it because of something you have read on this or any web site.